1994-2018 Dodge/RAM 19.5" x 6.00" dual wheel direct fit 8-6.5" bolt circle 4.77" center bore hub pilot 3750 lbs. per wheel load rating. 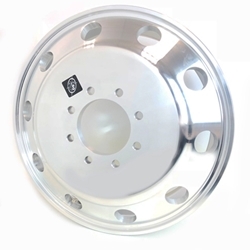 Set consist of two 19.5" x 6.00" dual steel wheels with valve stem, four 19.5" x 6.00" polished both sides aluminum dual wheels with valve stem, two front ABS center caps, and two rear ABS center caps. This kit is built to accept a 22570R19.5 tires. 5 year warranty. 1994-2018 Dodge/RAM 19.5" x 6.00" dual wheel direct fit 8-6.5" bolt circle 4.77" center bore hub pilot 3750 lbs. per wheel load rating.